Faith and The Cosmos: Can Catholic universities foster dialogue between religion and science? When I started teaching in 1996, I was hired by Trinity College in Hartford, Conn., to teach a course on science and religion. With degrees in both areas, I felt well prepared; but I soon learned that the amount of literature on the relationship between these two topics had swelled enormously. The growth rate of scientific progress in our time is astounding. Rapid advances in technology make it difficult to keep abreast of progress in such areas as genetics, robotics, molecular biology and neuroscience. Discoveries in cosmology, astronomy and physics continue to disclose a universe that is ancient, dynamic, interconnected and expanding. As technology advances at an exponential rate, it drives other areas of modern life to accelerate exponentially as well. The rapidity of technological change, writes the philosopher Nick Bostrom, suggests that continued innovation will have an even larger impact on humanity in future decades. With these changes come new moral and religious questions, and the Catholic Church needs theologians willing to address them. Unfortunately, few Catholic universities have devoted resources to educating theologians willing to engage with the scientific world. This is a loss for both academic disciplines. If the secular, scientific culture behaves like a rabbit, leaping across vast areas of discovery and invention, the Catholic Church too often behaves like a turtle, crawling up from behind, hesitant to accept new scientific discoveries. The slow pace of the churchs embrace of science is not because of a hesitant pope. 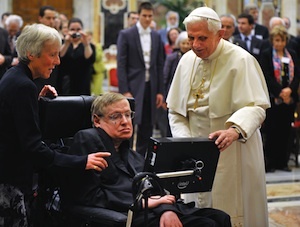 Benedict XVI has worked to connect the two disciplines, establishing within the Vatican, under the Pontifical Council of Culture, a department dedicated to dialogue between science and theology. The pope has issued various statements on the sciences and their impact on humanity and the earth and has expressed to Catholic youth his support of new computer technologies, when used correctly, to connect with others. Overall, though, many theologians are reluctant to engage developments in science. It does not help that within the universities theology has been isolated from the sciences. The mechanization and specialization of higher education has rendered the university a multiversity. Instead of educating students to know the universe and stars turning together as one, academic disciplines, including theology and philosophy, have become highly specialized, competitive fields. If the modern church is reluctant to embrace insights from modern science as integral to revelation, part of the hesitancy may be due to the place theology holds within the academy. In his book The Soul of America, the historian George Marsden recounts how and when higher education in general became hostile to religion. By the 1920s many universities, despite their religious roots, had grown increasingly secular, sidelining or even scorning religion. The separation of science from such humanistic fields as religion, history and literature created a model of university life that did not allow any positive role for religious people, institutions or ideas on campus. One had to leave religion at the door or privatize it. As a result, students did not learn how to connect science with areas of meaning and value. Elaine Ecklund, a sociologist at Rice University and the author of Science vs. Religion: What Scientists Really Think, suggests that by separating religion from the rest of university education, the American university lost its soul. The church has been a patron of the sciences throughout the ages, although not consistently. Major events like the Galileo affair and the rise of Protestantism caused a psychic trauma for the church, write Peter Hess and Paul Allen in their excellent book, Catholicism and Science. Although the church did not shut the door to scientific research, events like these also stifled openness to scientific innovations. Theology, however, entered the 20th century as a closed set of neo-Thomistic discourses with questions and rules set by neo-scholastic philosophy with few, if any, other intellectual or cultural sources, says Paul Crowley, S.J., the chair of religious studies at Santa Clara University, that did not cohere with existing papal efforts to support scientific research. Still, in the 1930s the Vatican had moved its astronomical observatory out of the city of Rome to Castel Gandolfo and outfitted it with modern equipment and in 1979 established the Pontifical Academy of Sciences to demonstrate the churchs commitment to scientific research. The Pontifical Academy, declared Pope John Paul II, is a visible sign, raised among the people of the world, of a profound harmony that can exist between the truths of science and the truths of faith. Some theologians have worked to connect these truths. Karl Rahner, S.J., did not shy away from exploring connections between matter and the soul or from considering the theological implications of life on other planets. Another Jesuit priest, Bernard Lonergan, drew on the scientific method to develop a method of theology. Today, some Catholic theologians (like John F. Haught) engage the sciences to illuminate areas of systematic theology like divine action; others (like Denis Edwards) are trying to deepen theological insight on questions in ecology, such as climate change. But on the whole, Catholic theology remains a product of Augustinian, Thomistic and Aristotelian ideas. Few Catholic theologians are grappling with the sciences on their own terms as a means of theological reflection. In the late 20th century, as theology entered into dialogue with the cultural pluralities of gender, race, history and philosophy, it nonetheless settled into the university system as an academic silo, just as the sciences sequestered themselves into specialized disciplines. Religion and science grew more estranged. Theology students are trained in departments independent of a broader integration with the sciences in the university. As a result, according to William Stoeger, S.J., of the Vatican observatory, there are few theologians or theologically interested philosophers at universities where the most significant scientific work is done. Even the annual meeting of the Catholic Theological Society of America, where attention is given to major currents in theology, does not show much engagement with the sciences. Of its 16 topical areas of discussion, only one is devoted to theology and the natural sciences. In his book Religion and Science, Ian Barbour laid out four types of relationships between science and religion: conflict, independence, dialogue and integration. While scientists tend to see the relationship between the two disciplines as one of either conflict or independence, theologians, when they are interested, tend toward dialogue and integration. Undoubtedly, science and religion are independent disciplines, each with its own language, methods and tools of analysis, but the academic structure has kept them intellectually as well as spatially apart. Reforming this structure to promote dialogue is key, since scientific language is technical and objective, and the descriptions of scientific findings do not readily invite theology-minded students into discussion without a teacher. Both disciplines present unique challenges, but it is not difficult to see why a theologian may more readily delve into the familiar theses of St. Thomas Aquinas over the unfamiliar formulas of Albert Einstein, or why the reverse might be true for scientists. Scientists who are interested in religion or express religious belief often have little opportunity in the academy to discuss religion as it relates to their work. Some universities, like Santa Clara, are making a concerted effort to engage scientists and theologians in discussion on meaning and value, but such initiatives are rare. The term Catholic sacramental imagination has long been used for the typically Catholic view that the material world can bring people into intimate relationship with God. The term captures the heart of the Catholic intellectual tradition, which is rooted in the richness of the material cosmos as a fit dwelling for the divine. While the church recognizes the importance of science for the development of faith, it also recognizes the limits of science as the ultimate horizon of meaning. The value of science, Pope John Paul II wrote, is that it can purify religion from error and superstition, just as religion can purify science from idolatry and false absolutes. Although the church continues to bridge science and religion, the significance of this dialogue for the life of faith cannot be left to the institutional church alone. Theologians are needed to reflect on the big questions of meaning and purpose in light of evolution, ecology and technology, as well as to comment on the moral questions raised, especially by the biomedical sciences. Science and religion make their best contributions when each can speak to the other of the truth of reality. As Paul Crowley, S.J., observes, If theology cannot engage a culture that has been framed by the paradigms of science, then theology itself risks self-marginalization. It has no voice at the table concerning the significant issues facing humanity today and becomes an exercise in history and hermeneutics. On the other hand, unbridled science can become scientism, making broad philosophical claims without the development of philosophical foundations. Catholic universities must become leaders in integrating science and religion. John Haughey, S.J., writes that the Catholic intellectual tradition is one of making wholes. Yet few Catholic universities offer courses or programs in science and religion, and those that do attract relatively few students, not all of whom are adequately prepared for such discussions. Several years ago, a colleague and I initiated a certificate program in religion and science at Washington Theological Union, a graduate school of theology and ministry in Washington, D.C., but the program was eventually discontinued for lack of student interest. At the Gregorian University in Rome, Gennaro Auletta and colleagues have developed a program called Science and the Ontological Quest, which is responsible for coordinating science and religion courses in six Roman pontifical universities. Although only a small number of seminarians are taking such courses, the engagement of seminarians in the dialogue between science and religion may be one of the most crucial pastoral needs of our time. Catholic universities need an invigoration of the Catholic imagination, for which dialogue between science and religion is a rich source. Theology cannot continue to develop apart from 21st-century cosmology and ecology, nor can science substitute for religion. The dialogue between science and religion has been developing in the last few decades, but Catholic universities have been slow to support this mutual enrichment. Developing collaborative structures of interaction between science and religion on the university level can benefit students and faculty alike, not only academically but also spiritually. While the current structure of academic specialization makes dialogue difficult as an integral part of university life and thought, universities must support existing centers of dialogue, like the Woodstock Theological Center at Georgetown University. Centers like these serve as bridge-builders and integrators, bringing together faculty, students and professionals across the disciplines. To restore soul to the university may require a re-imagining of education, including a search for new ways to develop dialogue between science and religion. Development of this relationship can enrich personal life, community life and the life of the planet. As John Paul II wrote, The things of the earth and the concerns of faith derive from the same God, for it is one and the same Love which moves the sun and the other stars. Both the light of faith and the insights of science can help humanity evolve toward a more sustainable future. A good start would be to give enough understanding of relations between faith and science to future theology professors and students at seminaries. Theologians need to see science has a lot to do with religion and become also aware of their role as pastors also and not only as scholars. It seems that while studying, theologians focus only on their speciality. They need a broader range. Wondering why theology seems estranged from science is like wondering why the control freaks in the church fear anything new. Many of our catholic hierarcy have little understanding of science and at times less of an understanding of theology, except when it serves as a whip to conform the laity to their medieval thought. Small wonder theologians seeking fresh, new thought have abandon catholic universities for refuge in secular universities where they are free to contemplate and wonder without fear of episcopal vengeance. When the popular culture sees that Catholic theology is reconciled with science what an evangelical advantage will ensue. When art was so reconciled in the middle ages a few good centuries of evangelizing happened. Say hello to the cathedrals. And the 'anti-science' fundamentalists [maybe Muslims too] will have to feed on the left overs. let's do it.. Dialogue about and between theology and science needs to begin before the university. Too often, adolescents are presented with a conflict between science and theology in the guise of discussions of problems of society like abortion, euthanasia, drug abuse, discrimination, etc. in which scientific insights tend to emphasized above thological insights. It seems to me that this dialogue needs to be part of the church's youth, sacramental preparation and RCIA progrrams. You wrote: "Another Jesuit priest, Bernard Lonergan, drew on the scientific method to develop a method of theology." No. That is not true. That is a false. I hope that you... no, many! will one day discover how remarkably relevant Lonergan's work is to all the problems you have pointed at in your brief essay. Good comments, and thanks for the link. I read your lead article, "
Are the Ten Commandments the foundation of American law?" I have to tell you that it is a breath of fresh air. I say that not because I agree with everything, but because there is something worthwhile to discuss and with which one can argue. Personally, I do not care for ideas with which there can be no argument. For example, "We should all do good, and avoid evil." OK, now where do we go from here? That is why I found your article - and your blog site - so interesting. I recommend your link to all readers. Come and you will find something to argue about. In the process we will all learn something. I appreciate the fact that you used "...the enumeration of the [Ten] Commandments traditional in Orthodox, Anglican, and Reformed churches...". More people should take note that when it comes to coveting, no distinctions are made among a man's house, land, wife, donkey, ox, or servants. Now there is something to argue about. As a scientist and teacher, myself, I understand your issues with students who have not the foggiest notion about fundamental issues of science and methodology and the acquisition of knowledge. Kurt Vonnegut said that it only gets worse from here. Maybe so, but we keep trying. Good luck. One problem of the Catholic Church's approach to science is that it refuses to give scientific findings status vis a vis theology if they indicate a for modifying its interpretation of revealed truth. Perhaps the most obvious example is the scientific evidence against Adam and Eve being actual historical beings. Without them the entire concept of Original Sin and "the Fall" needs considerable revision (as my Benedictine Theologian friends agree). But the Vatican seemingly will have none of it. John Haught's concept, which replaces the tradition of "fallen nature", is one of constant becoming. Thus human kind's propensity to sin is a consequence of its evolutionary contingency, not some single moment of turning away from God in a garden, and Christ's redeeming act was not so much to wash away Original Sin (but not apparently its effects), as to continue humans more accurately on spiritual growth. There are many other examples where science is telling us one thing, but the Vatican is refusing to give it the required status to influence theology. Until this changes, nothing the Church can say or do will significantly ameliorate the problem of science and religion within the Catholic Church. Also noteworthy, I think, is the work of theologian Terence Fretheim in his masterful book, “Creation Untamed.” Therein it seems to me, Professor Fretheim shows how Jesus’ Father does work “even now” but not in a micromanaging way. Instead he allows existing creatures to bring into being other creatures not previously existing. He does this through the dynamism that exists throughout creation, by way of erosion, glacial activity, volcanic eruptions, the “messiness” of creation as Fretheim calls it, which includes natural disasters, about which according to Fretheim God feels “sorry” for having granted creation so much freedom! Through all of this the face of the earth is changed, mountains, valleys, other land masses appear not previously existing - creatures helping to create other creatures, God sharing with the Cosmos his creative abilities! Terence Freitheim says so much more and says it so much better! Ilia Delio is the right person to write on “Faith and The Cosmos.” She is a spiritual daughter of Francis of Assisi, Patron Saint of Ecology, sharing the spiritual DNA of the man who would call the sun “brother” and the moon, “sister.” His spirit permeates her soul! Yes, it’s time for “Faith and The Cosmos” to be embraced as two parts of the same thing the “thing” being the quest for truth, both together a library of truth! It’s time to move beyond the “darkness” of the so-called “Enlightenment” responsible for the breech between religion and science. It wasn’t always so. It’s time to get rid of that Maniple mentality that seems to relish crazily ‘the way things were.” It’ time for Catholic Universities to foster dialogue between religion and science for the good of humanity and to the glory of God! The thing that strikes me, from time to time, when I read about the necessity for Catholic universities to take the lead in potentially controversial directions, is the history of these universities having to continuously look over their shoulders to see if anybody from Rome is getting ready to lower the boom. The following paragraph from the author raises the possibility for a new approach. "Several years ago, a colleague and I initiated a certificate program in religion and science at Washington Theological Union, a graduate school of theology and ministry in Washington, D.C., but the program was eventually discontinued for lack of student interest. At the Gregorian University in Rome, Gennaro Auletta and colleagues have developed a program called Science and the Ontological Quest, which is responsible for coordinating science and religion courses in six Roman pontifical universities. Although only a small number of seminarians are taking such courses, the engagement of seminarians in the dialogue between science and religion may be one of the most crucial pastoral needs of our time." Here's the idea. Persuade some now or future pope who pronounces in general terms how nice it would be to integrate the big ideas from science (preferably basic science, not technological applications) and those from theology in a coherent search for truth, to actually establish in the pontifical universities substantial fellowships for scientists to study theology and for theologians to study science (and the necessary math tools, of course), with the aim of forming one or more advanced research institutes concerned with science and theology. If such a pope could be discovered with the courage of his convictions, possibly numerous Catholic universities in numerous countries with a wide diversity of cultural backgrounds would find the courage to follow suit, and undergraduates, given the availability of additional fellowships, would begin to show an interest. I imagine the principle reason why theologians don't try desperately to engage science wherever it innovates is that they don't see the need. Science is about one thing - the measurable world - and religion is about quite another. There's no common denominator. "As a scientist and teacher, myself, I understand your issues with students who have not the foggiest notion about fundamental issues of science and methodology and the acquisition of knowledge." What's that got to do with religion? Is God discoverable only through the scientific method? First of all, Ilia, great article! Thank you for it. Next, Norman, I would respectfully suggest the problem with your own approach to science is the pre-eminent status you give it, over and above theology. From the little that you've written here, it would seem that you believe science provides people with solid, factual proofs about life in all its facets while religion essentially takes a back seat, filling in all the unknown blanks until such time as science can come along and provide us with the "real" (and definitive) answer. But that's not how it works. Science is not strictly sets of "2+2 = 4's". There is probably more speculation that goes into science than there does into religious doctrine. And faith is not a mental exercise in arbitrary choices of plausible explanations for the existence and function of things (meant to eventually be replaced with "cold, hard scientific truth"). It is adherence (obedience) to an actual Being (God) whom we do not typically see, feel, or hear but who is, mysteriously, much more real than we are nonetheless. Because of His transcendant nature and the trascendant nature of the spiritual realm in general, we are entirely dependent upon God to reveal Himself to us before we can possibly have any clue as to who He is. As a Christian, you are bound to believe (not just by law but by logic) to believe that God reveals Himself to us not solely through the vehicle of the natural world, but directly and supernaturally as well through the magisterium of the Church. The doctrines of Original Sin and Monogenism are dogmas of the faith. This means that if they are not literally true, then the Trinity, Scripture being the Word of God and all other core Christian truths are up for dismissal along with them. Since that obviously isn't possible, I strongly question what you perceive to be "evidence that Adam and Eve did not actually exist." They did, or whole the Catholic Church can pack up and head home. Were our first parents' names necessarily "Adam" and "Eve"? No. Could they have received their physical bodies from apes or other animal life forms? Yes. (But not their souls.) Monogensim does not exclude that possibility. But rest assured Adam and Eve (and the whole human race's descent from them) were real and that, one day science will prove this to be true. You can (and have to) quite literally bet your faith on it. Science once believed the universe to be eternal (to have had no beginning) while the Bible spoke, curiously, of a "beginning" (see Genesis 1:1). Then a Catholic priest came along and demonstrated to the world that indeed the universe did have a beginning after all, as articulated in the Big Bang theory. Because God is the source of Divine Revelation (sacred theology), you can expect more of those same types of corrections until that proverbial group of scientists scaling a massive mountain (representing all the wonders of the universe) arrives at the mountain's peak...only to observe a group of theologians (native to the peak) resting peacefully, eating their lunches on a bench. Science is not just about theories. It is not just an intellectual exercise. Science is often about life itself. The Catholic Church's magisterium should not be outstanding only in silencing scientists and theologians involved in current scientific fields of biology and social sciences. For all the progress that the various sciences have made in helping us understand the rich variety of human sexuality, because of prevaling religious attitudes and "teachings", homosexuality remains a heavy burden for adolescents. "Suicide is the leading cause of death among gay male, lesbian and transexual youth," says a Secretary's Report on youth suicide by the U.S. Department of Health and Human Services. Understanding of the diverse nature of human sexuality, and homosexuality in particular, has undergone enormous shifts in the past century through the intricate workings of the social sciences and modern social theory. Some confessors are decades behind, while still binding the conscience of penitents in delicate question of homosexual orientation, in their dealing with gays, lesbians, and with related questions of marrage. May Catholic universities continue to foster dialogue between religion and science, between religion and life sciences in particular. I did not write, say, suggest, imply, or otherwise mean any of the ideas you attributed to me in your comment, # 14, especially your first paragraph. It is as if I said the word "science" and you were triggered into a finger waving, tongue lashing over some terrible things that, in fact, I never said. You may have some good points, but you have to go find someone else whose words might deserve your reproach. Usually it works the other way around. First someone actually says something you do not like, then you give them hell for it. K.I.S.S. “Keep it simple stupid!” A directive it has always been my misfortune to neglect. Above all, religious teaching in all evolving institutions of spirituality have frequently deviated from their founders’ teaching through grinding out thousands of volumes of theologies and liturgical laws and customs which tended to divide and separate peoples into orthodoxy and/or heterodoxy and heresy which in turn generated centuries of wars and hatreds lasting right up into the present day. The fear of breaking a rule or a law is a minimal response to an invitationto love. In the simplicity of Zen meditation, the focus of one’s attention is not on ideas one has of God, but rather on the present moment, the here and the now, and on the point of no dimensions which lies within each and every person and thing. This point of no dimensions is the same dimensionless point from which emanated all of what we call the entire cosmos. It seems to me, that the Buddha’s teaching is radically simple. He simply held up a blossom from the lotus plant and those who were enlightened, understood. The lotus itself is a plant which produces beautiful flowers which rest upon muddy waters. It is a symbol of a spiritual reality, the reality of Divine birth, the spontaneous generation, total spiritual perfection. In a like manner, Jesus’ teaching is essentially the same in its simplicity. In the very earliest gospel written, Mark’s, circa 65-75AD, Jesus’ opening words, his “keynote address”, as he entered Galilee were:‘The present moment is the right time, the kingdom of God is within you, [Metanoieite] change the way you think about reality and believe this good news. [Mk.1:15] To try to conceptualize this “Kingdom”, Jesus often used the simplest similes of nature, “…like a tiny mustard seed, the smallest seed in the world…” [Mk. 4:31]; and children understand:” …the Kingdom of God belongs to such as these[children]Mk.10:15. Current astrophysical understanding of the cosmos and its origin also point to an inconceivable reality which many have termed a “NON-DIMENSIONAL POINT” from which emanated all matter and energy which today constitutes this entire vastness which today we call the Universe. Now this is impossible to understand from purely scientific mode of thinking. “Nothing comes from nothing” is the expected reply to that astrophysical statement. A non-dimensional point does not mean very small, it means no size. That seems to be the same as “no thing”. The greatest Catholic theologian of all times is recognized as Thomas Aquinas. Near the end of his life, Thomas put down his pen and stopped writing the third volume of his Summa Theologica. When asked why he stopped, Thomas is reported as having said, “Compared to what I have seen, this is all such straw.” Thomas died in the Cistercian monastery of Fossa Nova. In other words, Saint Thomas literally ran out of a vocabulary which was great enough to capture the inconceivable, ineffable, Reality called “God”. The Reality Here, Now, and within all. This article also appeared in print, under the headline "Faith and The Cosmos," in the April 4, 2011 issue. Ilia Delio, O.S.F., is a senior fellow at Woodstock Theological Center, Georgetown University, where she concentrates on the area of science and religion.